JAMMU: Shri kailakh jyotish Avim Vedic Sansthan trust organized a program at Purkhoo, Domana program will be started with the tribute given to the soldiers who lost their lives for the country. On occasion Ex.Cabinet Minister Sham Lal Sharma, the Chief guest in this function and guest of honor Shri Amar Nath Shrine board member Dr. C M Seth(IFS Retd.). 'kailakh Sandesh Panchang calendar' brought out by shri kailakh jyotish Avim Vedic sansthan trust Raipur, Domana Jammu (Regt.) 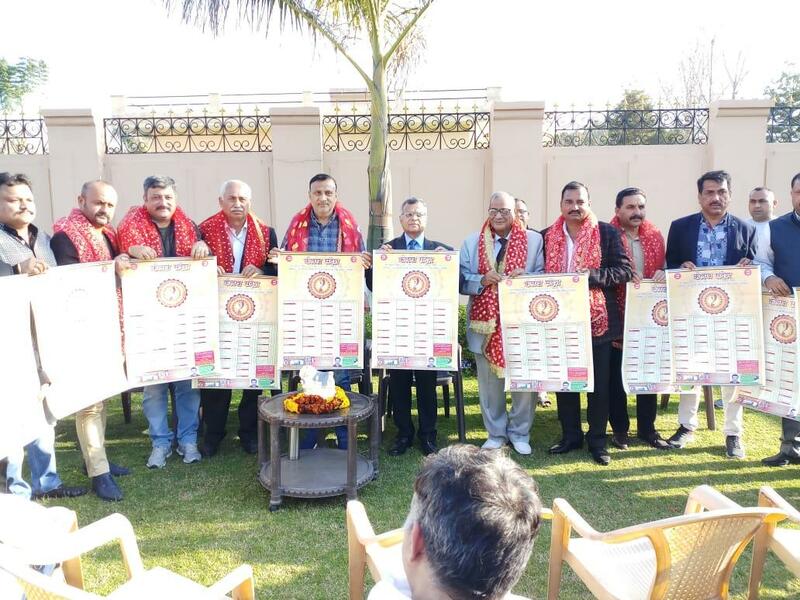 as they appreciating the utility of the panchang calendar, Sham Lal Sharma also said that it is a ready source of information about all local fairs, festivals and auspicious occasions, accurate dates and timing about the festivals and events like eclipses etc given in this calendar. He congratulate Dr. Chander Mouli Raina the Editor in Chief of the Panchang calendar and Sub Editor Pandit Dev Dutt Shastri, Bushan Shastri and Deepak Shastri and sponsored of panchang calendar Sh.S C Suri Chairman of Dewan Devi School, Shakti Nagar. Dr. C M Seth appeals to remain united and to work for the preservation of their culture and their moral values. At the time of releasing the panchang calendar following are the dignitaries are also gathered in the program: Team jammu chairman Zorawar singh, President Awardee Bupinder shastri, Mahant Bawa jitto Hardutt sharma, Dr vinod shastri, Swami Sucheta Anand ji, Advocate Pawan khajuria, Sarpanch Partap singh,Prof.Daya Nath, Puran chand shastri, Surinder Singh gilli, Ashwani Suri Administrator Dewan Devi school, Rakesh Master, Bushan jamwal, Vivek Gupta, Vicky Mehra, Jagan Singh, Kuljeet Singh, Amarjeet Singh, Sunil Singh Raipuria, Shiv kumar Sharma, Rajesh Sharma, Pt.Tilak Raj shastri, Pt.Puran chand shastri, Nigam Gupta, Krishan sharma, Master Vijay sharma, Gulam Rasool, vijay seth, kripal shastri and other also present in the program.